Compare to the popular game "Scattergories" or "Name 10"
Use as a Question or Brain Teaser of the day on the daily schedule of activities handout or on a display board. Set up is simple. Just print, cut, laminate, and play. Participants must choose one letter of the alphabet and at least one category card; name as many words as possible using a timer or a word limit (example: 10 words). There are many ways to play this game. You can post one category card/one letter card on the main bulletin board and allow anyone to add a word to an ongoing list. As a weekend/evening activity, participants must turn in a sheet of paper with (x) words for a prize. In small groups, participants will need to work with a team (family members, other residents, etc.) to come up with a list of words. 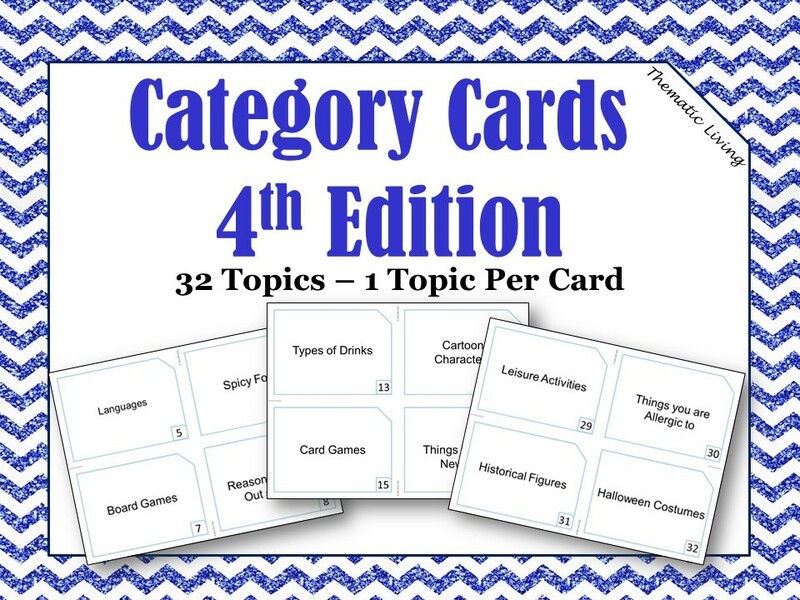 You can choose to use with or without the letter cards, complete the entire alphabet for one/many cards, or use multiple category/letter cards, or multiple letter cards. The possibilities are endless. For best results, laminate the cards before use. Hole punch one corner and bind the cards together with a binder ring or ribbon. This activity can be modified to be used with participants who may have a mild/moderate form of dementia or who may be cognitively impaired.